It’s strange that most cuisines have some sort of variation on the humble meatball, and I think it’s a little sad that we Brits don’t think more highly of them. There’s a world of things that can be done with this method. This is the Thai version. Tod man mu are heavily spiced little pork meatballs, with a fiery chili kick and a rich seam of citrus flavours. This recipe came via Twitter, from @joolscyprien, who recommends eating them with a beer, mainly to quench the vicious chili , I suppose. They’re very easy to make – more of an assembly job than anything else – and if you’ve ever made an Italian meatball, you’ll know what you’re doing. Start with about half a kilo of the best quality minced pork you can find, then add a good handful each of of dried coconut and cooked jasmine rice, half a tin of coconut milk, two and a half to three generous tablespoons of Thai red curry paste, the juice and zest of a lime, four or five finely chopped kaffir lime leaves, a big splash of nam pla, or fish sauce and as much chilli powder as you think you can stomach. You may or may not need to add an egg to bind the mixture together. Mix everything together and let it rest in the fridge for a while. Red curry paste is widely available these days and it’s a great ingredient to have around. You could make your own – it’s just a case of blending ingredients together in a blender, but the commercial versions are normally very good indeed and perfectly suited for making tod man with. As for the rest of the ingredients, there’s nothing there that a decent supermarket won’t be able to0 supply. Fry a small piece of the mixture and try it to test the seasoning. If it needs more salt, add more fish sauce. Shape teaspoons of the mixture into balls and fry in shallow oil until crisp. You can keep each batch warm in the oven whilst the rest are cooking. Serve with more jasmine and hot chili sauce over the top. Yes yes yes, I think the only way that these could be made any better is to enjoy them with a beer. Definitely mandatory. Coconut, keffir lime leaves, fish sauce, chili, jasmine rice…you had me at hello! What an interesting recipe, looks fab! This looks delicious and reminds me of another of my Thai favorites – Tod Mun. Wow, never made meatballs before, as they never really appealed to me. However spicy pork meatballs, I have to try those! I'm sorry? Never made meatballs before? Am I reading this correctly? 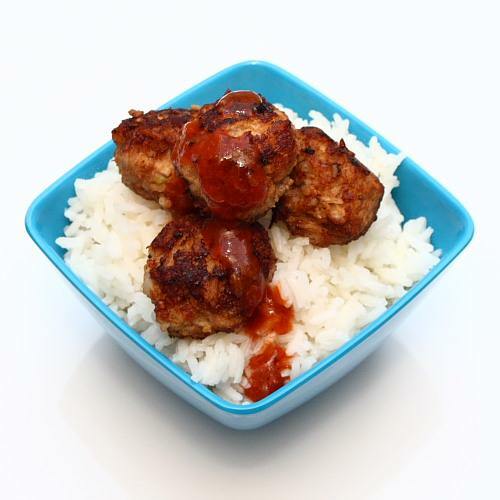 I love Asian meatballs and these look tremendous! Don't be too hard on Lauren; I'm not a fan of the "regular" meatballs either. It takes a unique one like these to catch my interest. Cheers. I love Thai spices, these look fantastic. I'm running for beer now. I stopped by through your gorgeous photo on photograzing. Wow! I love meatballs and I love Thai seasonings. These look great! These sound amazing! I've always been a big fan of meatballs, but this Thai version sounds even better. Great recipe. How refreshing to find a website where the comments aren’t mostly nasty, too. Congratulations. Seriously.